January 13, 2003 – February 17, 2011. We are heartbroken to have to report this news. Kip Koontz and J.D. 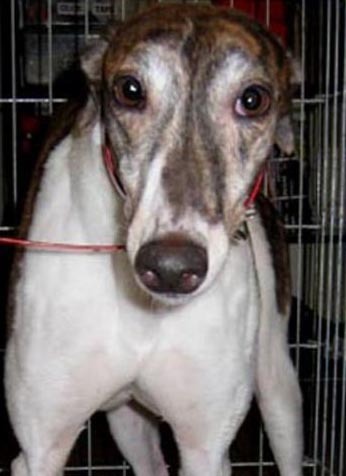 Hulse called us to inform us that their hound, Amelia, died during a routine dental. This is every adopter’s nighmare. Kip and J.D. adopted Amelia in early 2006. She was the eighteenth dog our group had placed. We’ve known Kip and J.D. for as long as we’ve had our group. They are not only great people and good adopters (they’ve adopted four greyhounds from us) but they have been active volunteers. Amelia was a seasoned meet and greet hound and was at many of our events over the years. We spent many summer evenings with Amelia when we visited Kip and J.D. and we shared almost all of our Thanksgiving dinners together (along with neighbors and adopters Lisa and Randy who live down the street). We have fond memories of all of the hounds lying around the house or nosing their way around for attention, and Amelia was the “princess” in the group. When we visited Kip and J.D.’s house, we could plan on getting a lot of kisses from Amelia as she loved seeing us as much as we loved seeing her. We apprecate the love and attention that Kip and J.D. gave Amelia. Amelia developed serious thyroid issues along with fears of loud noises and confusion. They never gave up on her. They did everything they could to make their home comfortable for her and to desensitize her to the noises she hated. She feared the noise from the early morning garbage truck making it’s rounds and on several occasions jumped through a screened window. Fortunately, she ran to Liza’s house each time so that Liza could comfort her and bring her home. Needless to say, Kip and J.D. are devastated as well as all of us in our FFGR, Inc. family. Rest in peace sweet Amelia knowing that you have so many who love you.